The 'Trump bounce' (apparently every random movement in the stock market has to have a root cause attributed, and a catchy name assigned by the financial media) during November saw the value of my geared stock portfolio and retirement savings each increase by around $20K. Sydney house prices continued to rise, pushing up the estimated valuation for my half of our house by around $24K. The mortgage balance was unchanged as last month we did a 'redraw' of the small extra amount we had paid off the interest only, fixed rate home loan (DW needed some extra spending money for a short holiday to China). The long-awaited 'Hospital Precinct Plan (draft)' came out yesterday - it looks like the council is only planning to rezone the four properties at the end of our street (adjacent to what is being transformed into a main road past the hospital) as 'high density', and not the bulk of the area falling within the 'hospital precinct' (at least not yet). That will probably mean we won't make any 'windfall' profit selling to a developer in the short term (2-5 years), and will stay put until we've retired and DS2 has moved out (since he's only starting Yr 5 OC next year, and will probably live at home while attending uni for at least his undergraduate studies, we might 'stay put' for another 12+ years!). Looks like I'll have to think about budgeting for some home maintenance costs after all. 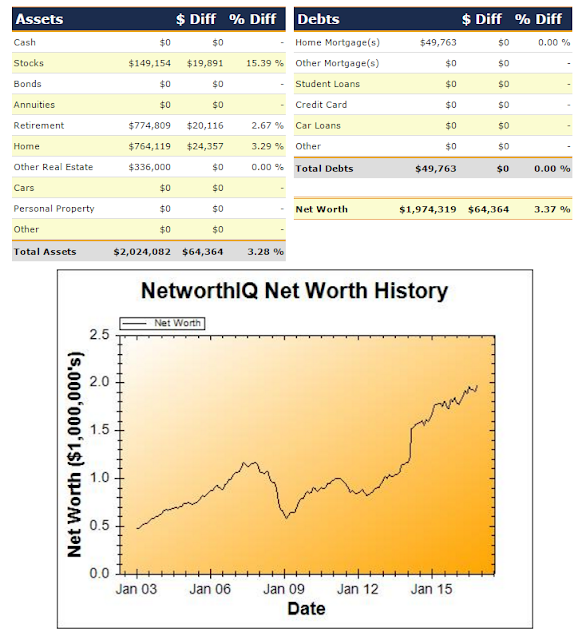 Overall, my net worth hit a new 'all time high' of A$1.974m, and I *might* just scrap into the 'multimillionare' club before the New Year.